Flowers have bloomed, the bees are buzzing, and we are starting to enjoy the warmer weather of spring. 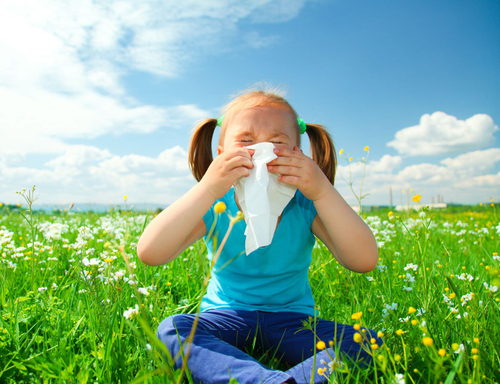 As we start to enjoy more outdoor activities, we may also begin to suffer from more allergy symptoms. According to the Center for Disease Control, more than 50 million Americans suffer from allergies each year. Not only is your car covered in pollen, but your eyes are itching, your nose is congested, and you can’t stop sneezing. Allergy sufferers may not only experience physical symptoms, but also mental and functional declines that affect their everyday lives. Utilizing medication, whether over-the-counter or prescription, is a common strategy to reduce allergy symptoms. 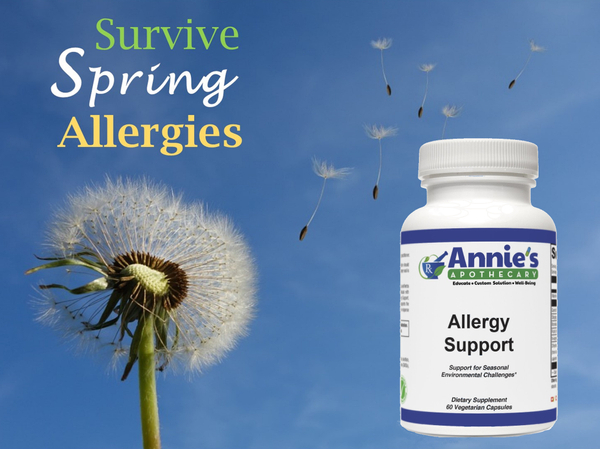 There are several antihistamines and nasal sprays used to reduce allergy symptoms, but if you want to try a natural alternative, Annie’s Allergy Support may be a good option for you. This product combines bioflavonoids, micronutrients and herbs that may help combat allergies. Dihydroquercetin (DHQ) is one of the bioflavonoids that may help protect tissues from harmful oxidation and inflammation caused by the allergen. A benefit to DHQ is that it is better absorbed than quercetin alone, which may be found in other products. Rutin is another bioflavonoid in this supplement that may help to reduce swelling and mucus buildup. Vitamins and minerals are another great resource to help reduce allergies. Vitamin C is an antioxidant that may help protect the immune system and deactivate histamine, which is involved in the immune response. Since Vitamin C can be hard on the stomach, we offer Buffered Vitamin C tablets and powder supplements that are much easier on sensitive stomachs. The requirements for Vitamin C also increase when the body is under stress, like when you are suffering from allergies. This addition to your regimen can be very beneficial. Zinc is a mineral that may also reduce oxidative stress on the immune system. It may also shorten the recovery time for acute health problems like allergies. The only problem is, when combined with other minerals, zinc is not well absorbed. The Zinc Glycinate form is unique, because it is well absorbed, even when combined with other minerals.